The asterisk means I’m tied for 13, with no less than George R.R. Martin. but no hints about what happens next. of the slide show I narrated at The Poisoned Pen. And because it has been so popular, I dare again to include a buy link for the Kate 20/20 mug with the Tsunami blend coffee. 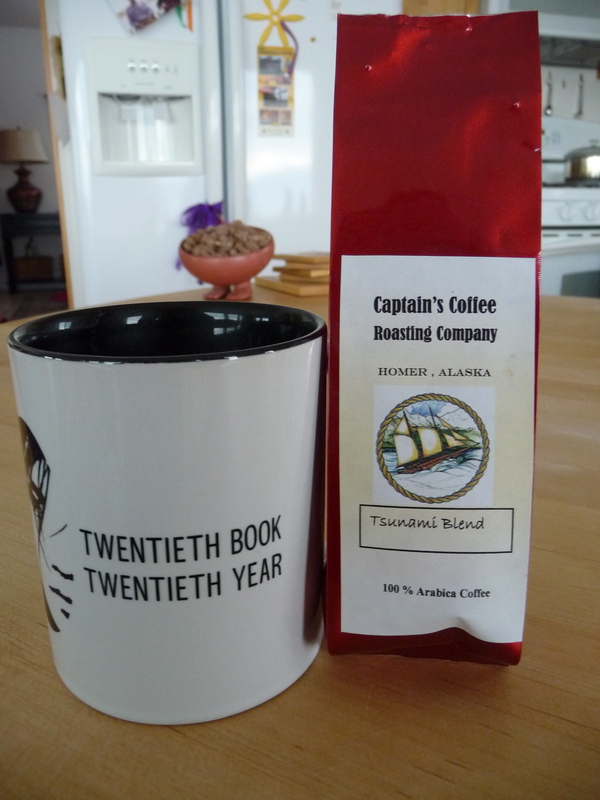 Tsunami Blend, you will remember, is Chopper Jim’s favorite coffee. Thank you for writing excellent books. You are a Really Good Writer which takes both talent and the grit, determination, and Hard Work to make that talent amount to something. As Robin McKinley remarked in her blog today, talent just makes it possible. I wish I could join the chat but I will be off looking at colleges with my daughter. What a lovely compliment, Karen, thank you! Robin McKinley is so right, it’s only one percent inspiration, the rest is perspiration. Have fun looking at colleges–my friend Judy had three girls back to back and she spent years looking at colleges with them. It sounded like a mother-daughter blast slash quality time to me. Started reading “Bad Blood” great so far. It’s good to see Kate back in action. Congratulations on your success! You deserve it for all the hard work and perserverance. My only complaint about “Bad Blood” is that it is too short. I can never get enough. I love all your characters, but the way you describe Alaska takes me right there. Thank you for 20 years of great reading. Hope we get at least 20 more! How soon does the next book come out? Am hoping Mutt is ok. I think Kate will be ok or else no more books in the series!!!!!! Please hurry! Yes! High praise from Charlaine, a very ballsy writer herself! Wow! Just Wow! Kate + Mutt + Jim +the Park version of Romeo and Juliet + the Hatfields and McCoys, all in one book..And a new Park map! Definately one of your best …read it in one very long night. I think my heart stopped until I read that the series was not ending! Thank you, thank you for such enjoyment! Ballsy – YES; Talented – YES; Is the book good? – YES! Is the ‘Printed List’ status well earned? – YES. Are you EVIL for the ending – YES! Thank you for the 27 novels of yours I have loved. Although if it wasn’t on a Nook Bad Blood would have ended up flung across the room at the end. Thank you all so much, everyone. Congratulations, Dana! What an honor! what can I say, that has not been said by all your fans? I really love your books, you write from the heart, about characters that come alive to us, an Alaska we can see through your description ….Your books keep getting better and better … And by continuing the lives of the characters we all love….just makes us want to be reading over your shoulder as you write the next book…. Keep going! Your fans adore your books! Just wish Someday you. Would be near here ( South Carolina) to do a book signing…but I imagine those are the bane of an authors life….. Thank you for sharing your Alaska with us…. 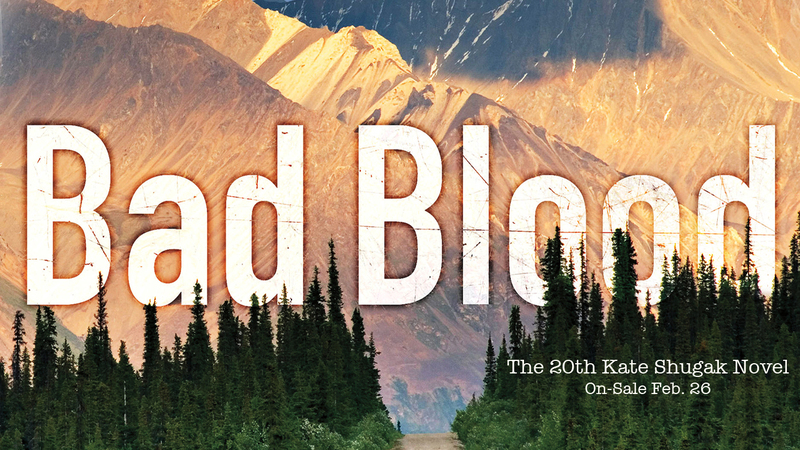 Just finished “Bad Blood” and I’m always sad to put Kate, Jim and Mutt down when I’m finished. I can only hope that I don’t have to wait too long to visit them again…. Just finished Bad Blood and resisted the urge to throw it across the room, unlike I remember Kate doing, and screaming “She can’t do that!” My sweetheart Bill and I discovered the Shugak books many years ago and competed with each other as to who brought the newest one home from the library for nearly two decades. Bill’s gone now, but I still think of him and wish I could talk your books over with him. He said I was going to love the Nordstrom’s scenes and I did. He said I’d love the crows’ Greek chorus with the unknowing (or at least ignoring) Liam Campbell, and I did. He’s not here to share Mutt’s growing assertiveness in straightening out Jim Chopin and anyone else who needs it. Whew! Keep’em coming. I’ll read whatever you write…and your recommended authors too: Ariana Franklin, Reginald Hill, and Richard Thompson. Thank you. We writers send these collections of words out there into the wild, never knowing how far they will reach or the effects they will have. Thank you all so much. I have been married for 56 years, a few years ago I introduced my husband to the woman called Kate Sugak and for all the years the only competition I have had is waiting for your next book. As they say, not too happy about the last ending but keep them coming. You have got us watching Alaska Highway Patrol and even understanding it. This from a gal from Newton Massachusetts who so hates the cold. I also will by trying your reading list, they must be good because you write a wonderful tale. Very well deserved Dana! Only four authors have written characters where I truly care what happens to them: Robert Heinlein, Steven Brust, Spider Robinson, and Dana Stabenow. I have every book, and every short story, and appreciate the glimpse you have given us of places that are special. I have to agree with Renee on this one: “Ballsy – YES; Talented – YES; Is the book good? – YES! Is the ‘Printed List’ status well earned? – YES. Are you EVIL for the ending – YES!” And although warned the ending was a cliffhanger, I scared my husband when I started screaming at my book. I think Liam is the next book: can’t wait! Just getting started and it is holding my attention. Would have loved a map. I got behind and didn’t get it done until too late to include it in the book. I love Kate and Mutt. Read the book and grieved the rest of the night! I hope some how your save them. Such a good series. Breaks my heart. Still greaving.